Many topics in Science and Computer Science especially in AI relate to deep philosophical questions that have yet to be resolved. I don’t think we should be designing machines that kill people, period. But if you are going to have machine’s that kill sometimes and military uses fund a lot of this research they may not be willing to encode the Asimov laws. At least not in the same ordering (ie. following human orders will be more important than saving lives). 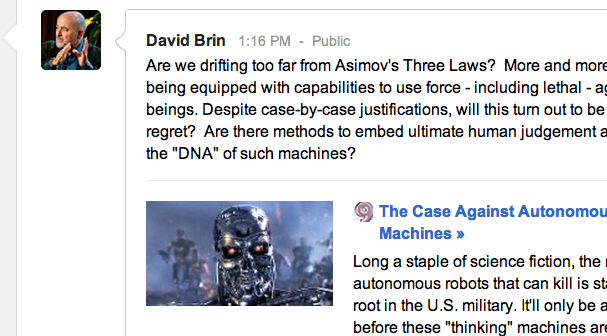 But a bigger question right now is whether an AI could reliably evaluate moral laws at all, even if it isn’t literally a killing machine. How sure does the system need to be that there is a human near by or that the machine’s actions will cause harm? How much failure are we willing to accept if it’s only 99% sure what it’s doing won’t cause harm? Think of google’s self driving cars. That’s the nearest, potentially deadliest robotic systems we need to worry about in our daily lives. Any wrong move while driving could harm the passengers as well as people in other cars. You can never be _sure_ you won’t get into an accident. So how sure do you have to be? Then every once in a way someone will get killed anyways, who’s the blame? The robot? The engineer? No one? If we define these laws too strictly we may stop ourselves from creating amazing technologies that change the world. But if it’s too loose or not present at all then we enter this moral grey zone where accidents happen even though they might not have happened with more processing time. Building the Enterprise? Seriously? Why not? I ignored this the first time I saw it and then I was going to make snarky comment that we should just send a bunch of ships to mars instead of building the Enterprise if we’re going to spend $1 trillion. But then I thought, at least look before you ridicule. Engineers are given a goal to get people to Mars on a give cost budget with a given risk level and they work out ways to do it as cheaply and safely as possible. This site argues that maybe we’re thinking about it all wrong. Maybe the right idea is to build a huge space taxi, that has launchable landing shuttles and artificial gravity and doesn’t ever get thrown away. We really do have the technology for a large ship with cosmic ray shielding and ion pulse drives powered by an onboard nuclear reactor to travel around the solar system. Oh, and high powered lasers even. What is the argument against this? Surely it can’t be that small, short missions are more efficient since they are more likely to get cancelled and delayed as we’ve seen. In a way this solution combines the best of robotic exploration and human exploration. Some probes can be designed ahead of time and brought in the hold of the ship. Having hundres of people on board allows the engineers to fix or even design new robots as needed. When problems arise humans can fix them on the spot. When something interesting is found they can change focus and go take a look. Sending a once-off ship with 6 people on it means everything has to be designed and optimized ahead of time. When you’ve got 100 engineers in orbit around Mars you don’t need to build so many failsafes into every probe in the same way. Give me a 100 engineers and a huge nuclear powered space ship with lasers and a store room full of spare parts and I can do anything. Last night I watched the historic launch of the first private corporation sending a vessel up into space to bring equipement and experiments to the International Space Station. The Dragon Capsule rose into the sky atop the Falcon 9 rocket built by SpaceX Incorporated. It was inspiring. Soon, they’ll be bringing up astronauts and maybe even tourists to visit the ISS on those modules. This would have been hard to imagine 20 years ago. Things can change. As more companies get into space lots of things are going to change. So why can’t we think big? The only problem is money and vision. But any politician who could pull this off cheap would go for it because it makes them look like they have vision even if they don’t. As for cost, it is very possible that a single all purpose, crewed vehicle like this would be cheaper in the long run and allow an order of magnitude more complex missions than a series of individual, custom designed probes. Currently we conduct a small number of experiences for each generation of scientists each costing billions and some failing. This proposal is to build a platform, not a single probe. One that has people on it who can fix it and improve as needed. It’s not like sending a scout or a reconnoissance plane, it’s like sending the whole aircraft carrier. Which would be better investment for improving the lot of humanity: building the Enterprise or a building 5 more aircraft carriers? About the money, I’ll just say this. If money ever stops humanity from expanding its knowledge of the universe then we might as well just give up now. We already know a lot, why are we building these particle colliders, bigger telescopes, gene mapping projects, supercomputers for weather simulations, global climate models, nano materials or exploring the depths of the ocean? Why? We do it because there is always more to know and what we don’t know can kill us. We need to boldly go where no one has gone before. That’s how humanity got this far and we can’t stop now. I don’t know if Building the Enterprise is the right solution, but it’s worth talking about. So let’s talk about it. Do you believe in the Multiverse? Great review article of cosmology by Martin Rees, the British Astronomer Royal : One universe among many? Some people complain that scientists should be wary of assuming everything in their math exists physically in our world. Very right, however, they should be just as careful to assume they know what ‘exists’ means and what can be true based on some notion of what makes sense to them. A good example from physics of crazy math leading to a real thing is that the idea of anti-matter first occurred to scientists only as a theoretical concept because some equation had both a negative and a positive root for the energy of an electron. Everyone assumed the negative root couldn’t possibly be ‘real’…until they discovered the positron which is now used in your local hospital and the smoke detector in your house. I’m no physicist, but I think it’s inevitable that some form of multiverse explanation for reality will be required to explain the fundamental cosmological questions physics is looking at. One thing I always wonder though is why so often people seem to mean a single, infinitely large universe with all possible events in it as the multiverse rather than an infinite number of separated universes which do not interact. The single approach isn’t really a multiverse isn’t really a multiverse it just something large enough to disallow communication, seems like a bit of a hack to me. But there could be some good theoretical reason in the physics that this is preferable to the ‘parallel dimensions’ approach. It seems like this has some pros and cons. Text analysis has advanced to the point where grammar and structure can be scored reliably, but meaning still gets left out. I would think you could do even better than this by searching wikipedia for correlations in concepts. Or perhaps ironically, scanning online essay databases people use for cheating. This could have the duel benefit of scoring the meaning somewhat as well as searching for exact matches which could indicate cheating. But even if these tools are used in combination with the teachers grading essays manually it should save them lots of time. All the grammar markups could be thrown up on the essay so the teacher doesn’t waste time correcting those and tries to asses the orthogonal problem of how good the student’s ideas or comprehension are.